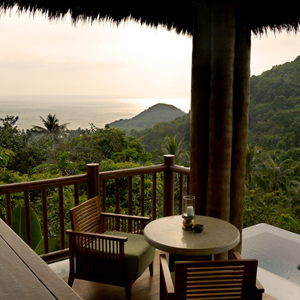 The Four Seasons Resort Koh Samui banks on having one of the world's most sought after resource: privacy. A popular getaway for famous faces due to its secluded location—even the best telescopic lens will only provide a blurry picture of you looking like an ant—this resort also features its own bay, a world class "forest spa", and two dining outlets. Every villa comes with a pool, and every day comes with a smile. Can't get enough of paradise? They also offer private residences. Exit Koh Samui International Airport (USM), turn left and follow signs to Highway 4171. Turn left onto Highway 4171. Turn right onto Highway 4169, then continue for approximately 20 minutes to Laem Yai. The entrance to Four Seasons Resort Koh Samui is on the right. W5 takes you on a scenario of your trip to Koh Samui with Four Seasons Resort as your host.